I was super excited for this soup...but really let down. First of all, when I put the soup in the pot, I noticed the broth was very thin, which took me aback since it looks like it would be a creamy, thick soup by looking at the cover. Also there was HARDLY any vegetables in it. After pouring out the broth, I saw that the vegetables only took up about 1/4 of my small saucepan, so already I felt I was off to a bad start. After rejoining my vegetables and the broth, I gave this soup a try. The few carrots and green beans were mushy, and the tofu was OK in consistency but very bland in flavor. The broth part had a tomato-based flavor, but also had an awkward after taste/spice flavor that reminded me of Cayenne pepper. 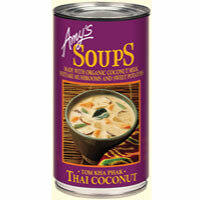 I honestly threw away the soup, as I couldn't finish it, and ate a different Amy's meal for dinner instead.